Turn your one simple idea into millions—without lifting a finger! —Patrick Lonergan, former vice president and general manager, Johnson & Johnson, and president/partner of NUMARK Laboratories, Inc.
For as long as you can remember, you’ve had a dream. You’ve longed to see your product idea come to fruition so you never have to work for anyone else again. Stephen Key has been living this dream for 30 years. The developer of such lucrative products as Michael Jordan’s WallBallR, the SpinformationR rotating label, and HotPicksR guitar picks, he knows better than anyone how to make a great living as an entrepreneur. Key develops ideas for new products, licenses them out, collects royalty checks, and doesn’t look back. You can do it, too. All you need is One Simple Idea. 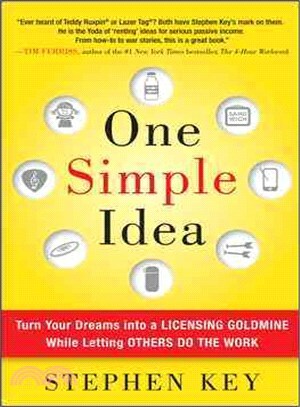 In this book, Key reveals the secrets that helped him and thousands of his students—including bestselling author Tim Ferriss—turn their creativity into a passive income generator by “renting” an idea to a company, which takes care of R&D, production, marketing, sales, accounting, distribution, and everything else you don’t want to do. The age-old business assumption that ideas must come from within organizations has been shattered. From global corporations to small businesses, companies have become so confident in outside entrepreneurs that licensing is now a $500 billion industry. Businesses need “freelancers” like Key—and you—to provide creative, marketable ideas for new offerings. With One Simple Idea, there’s no prototyping, no patents, and, best of all, no risk. You can make the system work for you—rather than the other way around. Stephen Key has successfully licensed more than 20 simple ideas that have generated billions of dollars of revenue. His "10 Steps to Bring Your Idea to Market" course, which can be found at www.inventright.com, has attracted more than 10,000 students around the world. Key lives in Modesto, CA.